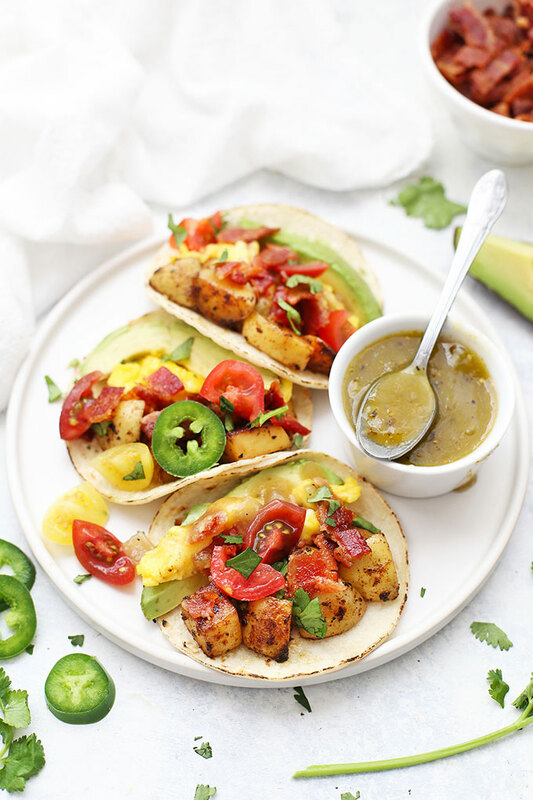 Potato & Egg Breakfast Tacos – If you love breakfast burritos, you’ll LOVE breakfast tacos! 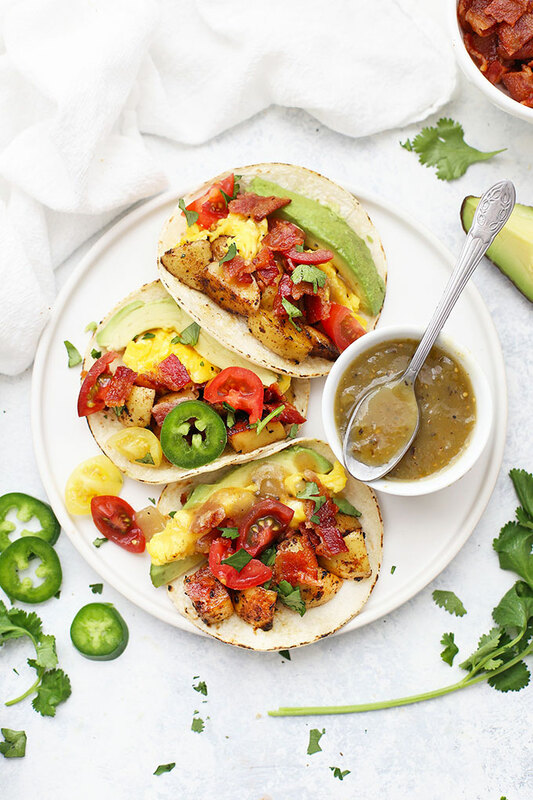 These tasty breakfast tacos are made from crispy seasoned potatoes, scrambled eggs, and all your favorite goodies! Scroll down for the full recipe + tips + how-to video! There’s a local restaurant in my city does these amazing potato and egg breakfast tacos with crispy potatoes, scrambled eggs, bacon or sausage, and this fantastic homemade verde sauce that’s got just enough heat without being too spicy first thing in the morning. It’s everything I love about a good breakfast burrito, but BETTER. So, so much better. We LOVE going there for breakfast tacos, but my kids can’t always wait till 8am to eat (they’re allergic to sleep and usually up well before 6 even on weekends). After a bit of trial and error, I’ve finally landed on a delicious homemade version of my favorite breakfast tacos. In my book, a good recipe starts with a good foundation of ingredients. 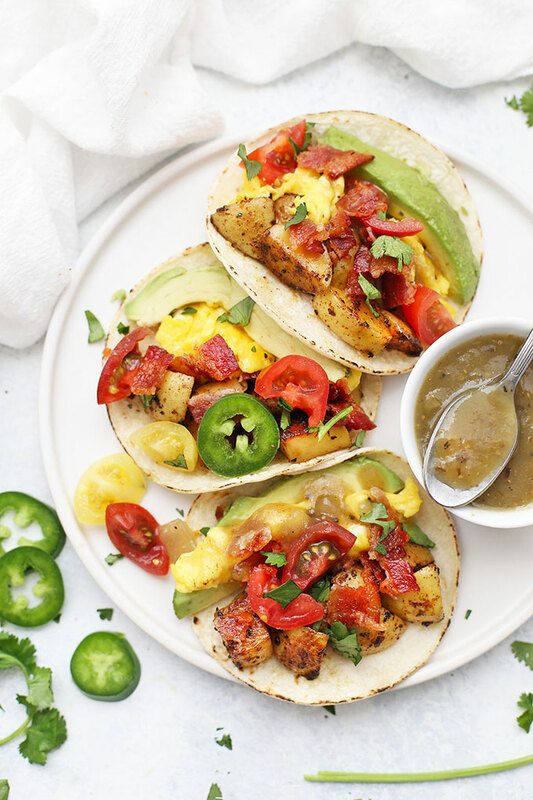 Every single component of these potato and egg breakfast tacos is delicious! Some Yummy Proteins. Breakfast tacos can be made using your favorite proteins, whether that’s crispy bacon, crumbled sausage, or simply some black beans. You can even skip the added protein and use some cheese instead, if that’s your jam. The Salsa Verde – I love all the salsas (peach, mango, pineapple, red, green, etc. ), but I especially love green salsa (or salsa verde) on breakfast tacos. It’s got lots of warmth and flavor and tastes so good with the seasonings on the potatoes. You can totally do homemade, but I usually use store-bought. (Sprouts’ Tomatillo Salsa is my FAVORITE!) If you’re more of a red salsa fan, you can totally go that route instead! 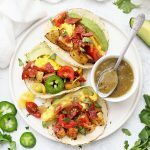 All the Goodies – If crispy seasoned potatoes, scrambled eggs, bacon, and salsa weren’t enough, you can also add all sorts of yummy extras to these breakfast tacos. 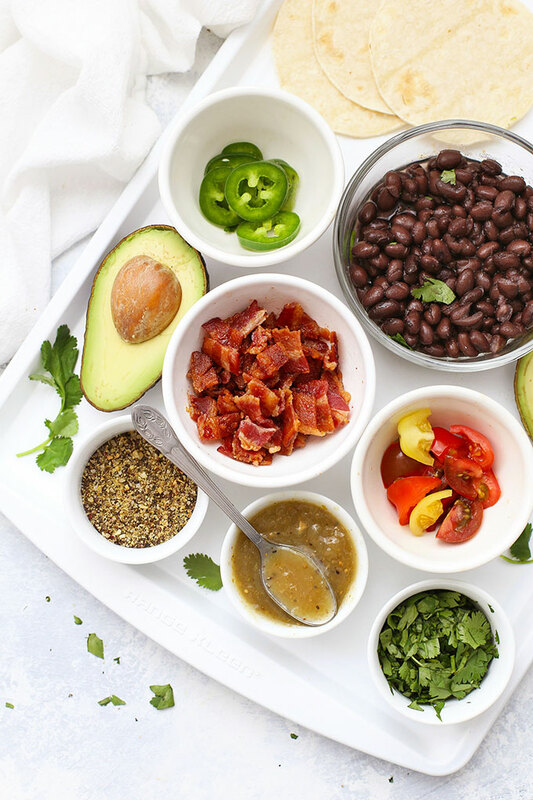 We like fresh cilantro, some diced tomatoes or pico de gallo, avocado slices, black beans, etc. You could add cheese, some peppers & onions, or whatever else makes you happy! Bake your bacon. Seriously! It’s a great way to make this a more hands-off meal. I also like that I don’t get all the splattering all over my stovetop (and really don’t notice it in my oven after). I put mine in the oven at 375 degrees F on a baking sheet lined with foil for 20-25 minutes, or until you reach your preferred crispiness. Get Extra Crispy Potatoes – If you can, I recommend cooking your potatoes in a cast iron skillet. 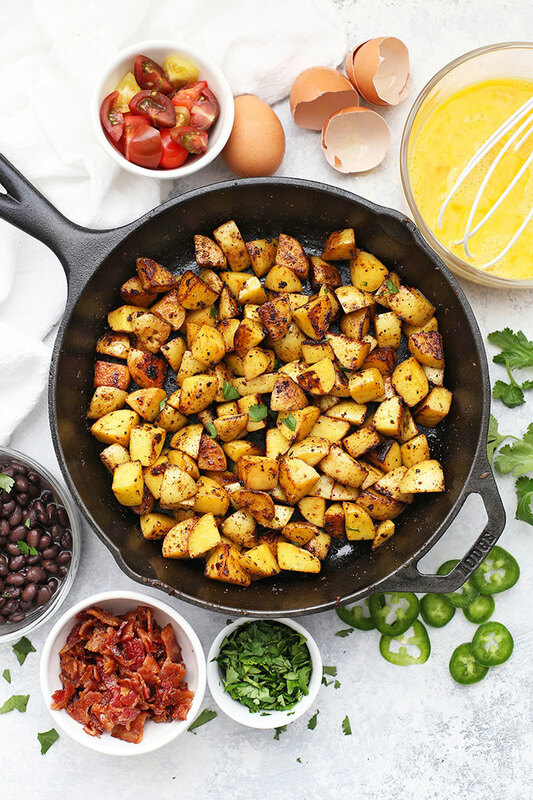 A cast iron skillet can hold onto and distribute heat more evenly than most and creates a gorgeous crispy effect on your potatoes. 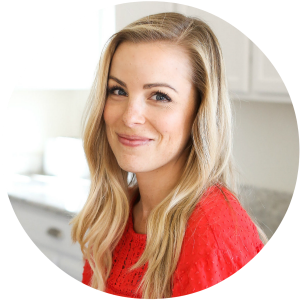 It’s an inexpensive addition to the kitchen and can literally last generations. Here’s the one I have and love. Otherwise, I recommend roasting your potatoes (see this post for how). How to Warm Your Corn Tortillas – The big trick with corn tortillas is to warm them up before using them. This helps with flexibility and pliability, but it also wakes up the flavor. I prefer to oven roast the potatoes, but I can’t seem to find the instructions for that. My reading skills are failing me lol. Ellen – I’m sorry! My fault! I forgot to include the link. Here’s how I roast potatoes: https://www.onelovelylife.com/roasted-breakfast-potatoes-and-veggies/. I hope that helps! Thanks! Wow, those potatoes look good. I must have missed that one the first time around. I can imagine a lot of uses for those potatoes. What a brilliant idea!!! We love breakfast burritos! Adding them to my menu next month. Thanks Emily! Okay, these are definitely going on my want-to-make list! They sound (and look!) absolutely scrumptious, Emily! That’s so nice of you Erica! I hope you guys LOVE them! Sophie *really* does!